An entire village turned into a place of mourning may sound like somewhere to be avoided on your holidays, but the village martyrisé of Oradour-sur-Glane is a place that’s not to be missed if you happen to find yourself anywhere near it. It all happened on a summer’s day in 1944. Just four days after the Anglo-American D-Day Landings, the Résistance in this part of the country had become emboldened by the impending arrival of their liberators and had escalated their attacks on the occupying German army, inflicting casualties and capturing senior officers. The people in the village didn’t expect the lash-back to be so severe. If they had known, they would surely have fled before the company of SS that arrived in the village on that fateful afternoon of June 10th, 1944. As well as the usual make-up of bakers, butchers, drapers, doctors, priests and hundreds of ordinary citizens and their families, there was also a contingent of refugees from other parts of France and some from over the border in Spain. 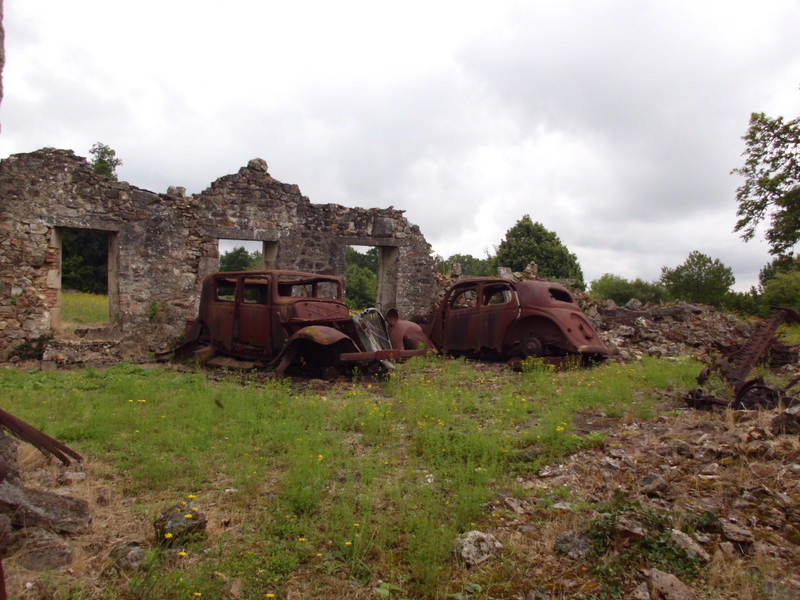 Virtually all those who were unfortunate enough to find themselves in Oradour were murdered. Even people who sought refuge in the church were shown no mercy from the vengeful force as the SS lobbed grenades into the crowds. Elsewhere, people were rounded up in groups and the order given to open fire at the same time. The invaders burned the entire village and attempted to destroy all the bodies of the 642 men, women and children that they killed. The destruction of the bodies was one of the main reasons that led to the decision to simply turn the village into a permanent place of mourning, rather than rebuild the settlement. 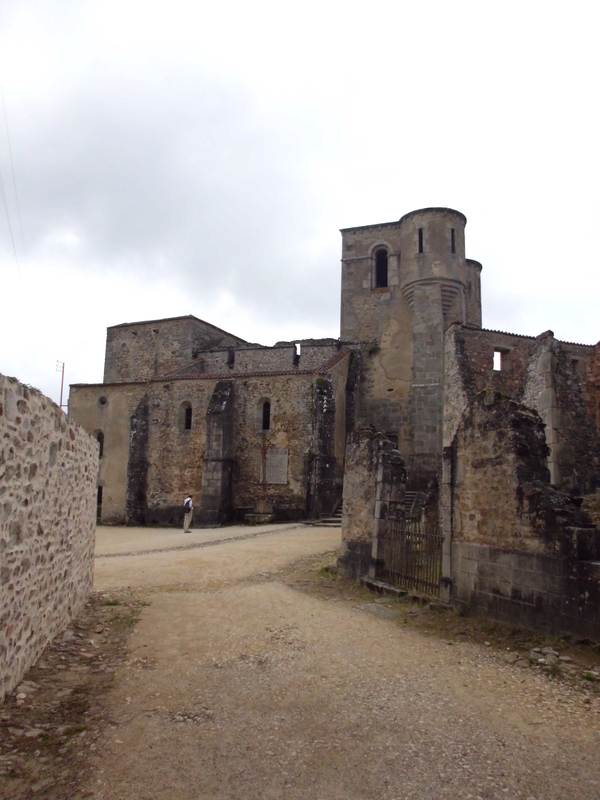 Instead, another “new” Oradour-sur-Glane was built beside the original village. Visitors enter the martyred village through a visitor centre/memorial. This whole museum is underground and you have the option of by-passing it and going straight into the village if you so choose. It’s definitely worth the extra time and expense to do this because it’s difficult to get a full appreciation of what you’re looking at when you do go to the village without getting a good understanding of the background of the war and of the specific circumstances that led to the massacre. Walking around the village is a truly surreal and humbling experience. The village is of dimensions that are larger than the typical Irish village. It was large enough, for example, to have its own tramway system connecting it with the Limousin capital Limoges 20km or so away. The tracks and overhead electric cables are still there, even though the trams are not. An old sign at the gateway into the village urges visitors to remember. On the day we were there, there was an eerie and respectful quietness. It is difficult enough to get your head around why they chose to slaughter all the occupants of the village. The commander in charge – Gruppenführer Heinz Lammerding – was a veteran of the Eastern Front, where massacres like this were common practice for the SS mobile units who worked on the belief that the Slavs were “sub-human”, but very rare for France. The commercial businesses in Oradour are identified by plaques put on the wall and everywhere, there are poignant reminders of the scale of the massacre. At the pharmacy, for example, a sign names the pharmacist and the members of his family who all perished before the shop, like all the other businesses and houses in Oradour, was burned down. Rusted skeletons of 1930s Citroëns, Renaults and Peugeots sit where they were last parked so many decades ago, as do some skeletons of beds within the houses that were destroyed. In the church down at the bottom of the village, a crushed pram sits in front of the altar as a reminder of the horror and physical marks on the walls are visible from the grenade shrapnel and bullets. It almost becomes too much to take in as you pass house after house and boulangerie after café after school. The graveyard is a few hundred metres outside looking over the village devoid of human life except for soft-spoken tourists. A large memorial dominates, with a wall bearing the names of all the victims and some of the recovered ashes and partially-burned remains on view. 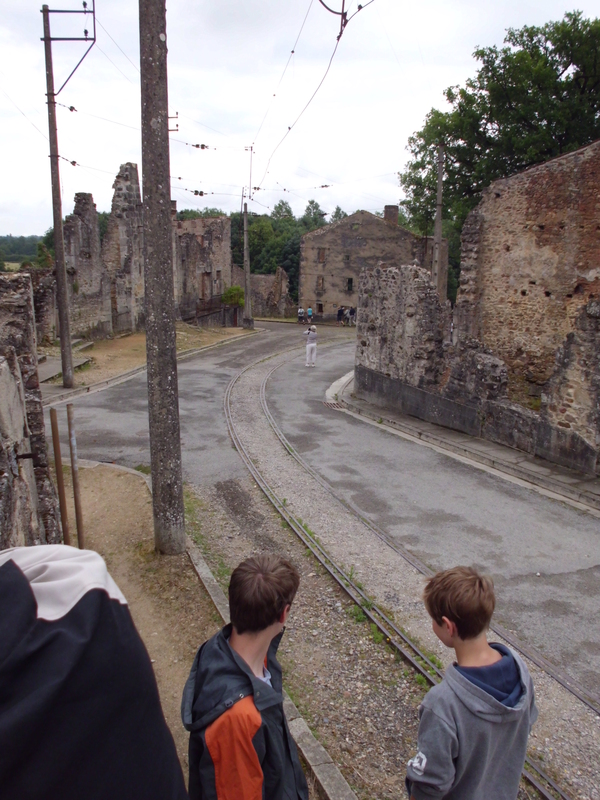 On the other side of the roundabout from the visitor centre, the newer town of Oradour begins. It’s actually quite a pleasant place – an typically Limousin pretty town that was clearly planned and built with the aim of ensuring that architectural ugliness was not going to be a legacy for the people of this area. We parked up and got a snack at the Boulangerie/Patisserie across the road from the Post Office on Avenue 10 Juin. We got some superb super-sweet home-made ice-cream cones. I thought it was as fitting and symbolic a gesture as you can get in putting the past to one side and creating the future. Oradour-sur-Glane is 22km north-west of Limoges. There are no direct scheduled flights from Ireland to Limoges but you have multiple choices with Ryanair by going via the UK. Alternatively, you can drive (very clearly signposted) or get Bus No. 12 from Limoges city centre. The website of Oradour-sur-Glane is another good source of information. The surrounding countryside is beautiful and peaceful and a good place for rambling or cycling. Previous Previous post: “Le Tour” – Poisoned Chalice? Nice video. It’s an amazing place, all right. I first heard about it ten years ago and didn’t believe it until I finally got to see it with my own eyse.